A review of the many ways to measure an athletes body composition. A monthly summary of the latest Strength & Conditioning, Nutrition, Coaching, Recovery, Technology, and Youth Development research. Body composition is of interest in fields of both health and sporting performance. In health, body composition has long been of interest, potentially more so with the excessive fat mass evident in obese populations, and the limited skeletal muscle mass in the elderly. In athletic performance, changes in body composition such as reduced fat mass and increased fat-free mass are often highlighted as determinants of successful performance, and the target of multiple interventions. Over the years, several methods of body composition measurement have been suggested and used, each method likely to have application in certain scenarios, with a trade-off usually occurring between accuracy and reliability, and cost and practicality. Fat Mass: The sum of all of the fat in the body. Fat-Free Mass: Mass that is not fat, including muscle tissue, bone, organs, minerals, blood. Each level has different compartments and can be separated into two, three or four compartments. How these compartments are measured and/or estimated varies, and will be elaborated on later in this article. Body composition provides objective data that is unobtainable from scale weight alone, such as the proportion of weight that is fat mass. For example, a coach may single out an individual as overweight based on scale weight or BMI. However, being heavier may be an advantage in some sports, if a greater proportion of the weight is skeletal muscle mass (e.g. a forward in rugby union). Body composition may also have application in weight-making sports, to determine the respective loss of FM and FFM during weight-cutting for a competition . In runners, an emphasis is placed on power-to-weight ratio, and optimising body composition is likely to be beneficial when attempting to improve this determinant of performance. On the flip side of that, body composition can be used to determine whether an athlete is fuelling sufficiently for performance. Research on the Female Athlete Triad has shown that low-energy availability (as determined using kg of FFM) can have negative impacts on several health markers, such as bone density . It is clear that body composition can provide valuable data for a number of athletes. An objective measure of body composition at baseline, and then at subsequent time points, can be helpful when determining an individual’s response to an intervention that has been put in place (e.g. a new diet plan). This is important, as objective data clearly shows the efficacy of an intervention, and if checked regularly, can allow for changes to be made. Body composition can be assessed in a number of different ways, with methods ranging in technicality, cost and accuracy. The only fully accurate measurement of body composition is cadaver whole-body dissection analysis, previously undertaken as part of the ‘Brussels Cadaver Analysis Study’ . In light of this, there are no in vivo techniques for body composition analysis that will provide complete accuracy, and so body composition assessment is an estimate, often made on assumptions regarding the proportions and properties of FM, FFM, water, protein and other minerals. 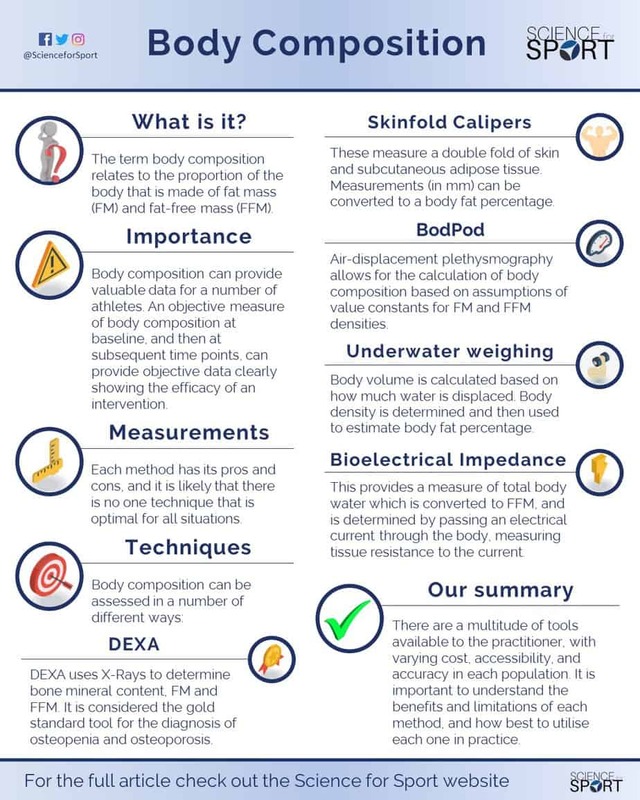 Methods which are likely more accessible to the general public include skinfold calipers and bioelectrical impedance analysis, whereas research laboratories and elite sports teams may have access to hydrostatic weighing, DEXA and Whole Body Plethysmography (BodPod). Each method has its pros and cons, and it is likely that there is no one technique that is optimal for all situations – this will be discussed in the following sections. DXA is based on a three-compartment model that measures bone mineral content, FM and FFM. A full body DXA involves the individual lying on an open scanner for approximately 8 minutes, whilst the ‘arm’ of the machine moves over the length of the body, and scanning using two x-ray beams. The more energy that is absorbed, the denser the tissue. Two energies are used to allow estimates of soft tissue absorption, separate to bone . DXA is considered the gold standard measurement tool for the diagnosis of osteopenia and osteoporosis . It is fast, non-invasive, and only exposes individuals to a small amount of radiation. The DXA also has the added benefit of providing segmental body composition analysis, which may be of particular interest when looking at bone mineral density in some athletic populations. Although it is often considered one of the most accurate methods of body composition analysis, it is not without limitations. In athletic populations, longitudinal data from repeated measurements of body composition may be affected by muscle glycogen levels, hydration status and changes in muscle metabolites such as creatine . This may lead to a misrepresentation of FFM, and these factors should be considered when interpreting the results of DXA estimates of body composition. Skinfold calipers measure a double fold of skin and subcutaneous adipose tissue and apply a constant pressure to the site. Skinfold measurements make the assumption that adipose tissue compresses in a predictable manner, that the thickness of skin is negligible, and the double layer compression is representative of an uncompressed single layer of adipose tissue. Measurements give results in millimetres, which can be then converted to a body fat percentage, with dozens of equations available for varying populations. A potential limitation of skinfold measurements is that they are dependent on the competency and accuracy of the person taking the measurements (i.e. intra-rater reliability). To minimise technical error of measurement, measurement sites and techniques have previously been defined . Practitioners can become accredited in anthropometric measurement through the International Society for the Advancement of Kinanthropometry (ISAK). To qualify, practitioners must assess various skinfold sites, girths and breadths, and report values within 10% of a Level 4 anthropometrist, and within 7.5% of their own values when repeating measurements. Skinfold measurements taken just one centimetre away from the defined ISAK sites have previously been shown to produce significant differences in measurement values at each site, indicating how important it is to mark and measure skinfolds correctly for accurate data . Therefore, the intra-rater reliability of the test is extremely important. Air-displacement plethysmography (ADP) can allow for the calculation of body composition through a 2-compartment model, based on assumptions of value constants for FM and FFM densities. ADP determines body volume by measuring the reduction in chamber volume caused by the introduction of a subject/athlete into a chamber with a fixed air volume . Body weight and body volume are determined by this method, with mass divided by volume providing a measure of density. Again, this measurement is a non-invasive and quick method, with the advantage of not requiring exposure to radiation. BodPod has been shown to be a valid measure of group average body composition when compared to DXA in female collegiate athletes . However, research has suggested a difference of 5.3% between the BodPod and validated four compartment models, with an error rate of 15% . BodPod has also shown limited accuracy when attempting to determine changes over time , a primary consideration when choosing an assessment method for athletes. Also known as ‘hydrostatic weighing’ or ‘underwater weighing’, hydrodensitometry works in a very similar way to the BodPod, in that it determines body volume, but this time based on how much water is displaced rather than air displacement. Body density is determined and then used to estimate body fat percentage. Again, this estimate is based on assumptions regarding the density of FFM, which may vary with age, gender, ethnicity and training status, potentially limiting its use in athletic populations . Although this method was previously considered the gold standard by the American College of Sports Medicine, it is not without measurement error. The results are highly reliant on subject performance, and as the process itself is uncomfortable, it may take multiple tests to get a valid measurement. For example, measurement error can occur through unsuccessful attempts to blow all of the air out of the lungs, or air bubbles trapped in hair or swimsuits. BIA is based on the concept that electric current flows through the body at different rates depending on its composition . It involves running a light electrical current through the body and determining body composition through the resistance of the tissues to the electrical current. This provides a measure of total body water, which is converted to FFM on the assumption that 73% of the body’s FFM is water . The low cost, speed of measurement and lack of need for technical expertise makes BIA an attractive option for body composition measurement, particularly in epidemiological research. However, the accuracy of BIA is dependent on several factors, and as a result, it is likely the least valid measure of body composition discussed in this article. BIA relies on empirical equations to estimate total body water, FFM and body cell mass. These equations use gender, age, weight, height and race as variables. Therefore, for BIA to be used as a valid measure of body composition, the correct equation must be used based on these factors . The validity of BIA in some populations has been questioned, particularly in obese patients , and in those with conditions that may alter fluid distribution, such as oedema . BIA data is influenced by hydration status, and although standardisation of fluid intake in the hours before testing may reduce the effects of hydration on body composition measurements, there is a lack of standardisation, or at least its reporting, in current research . This may also be true in applied practice with athletic populations. Exercise has been shown to lead to vast inaccuracies in body composition analysis using BIA , as has changes in hydration status . As a result, BIA may not be suitable for determining body composition changes due to fluctuations in hydration status following training. Body composition measurement in vivo is an estimate. As mentioned previously, the cost and practicality of measuring body composition varies greatly, and often there is a trade-off between the two. Each method has a use in certain settings, and it is the job of the practitioner or user to understand the benefits and drawbacks of each method. A further issue with body composition is often the focus of individuals on their absolute body fat percentage values. As highlighted previously, the variation in values can be significant, with differences in assessment method, the athlete’s physiological state and other assessment-specific variances affecting overall results. Rather than focusing on an absolute body fat number, it may be of more value to standardise measurement and track changes over time. Body composition reference values for a larger range of sports, including positional differences in sports where this may be significantly different. How body composition may determine performance in these sports. 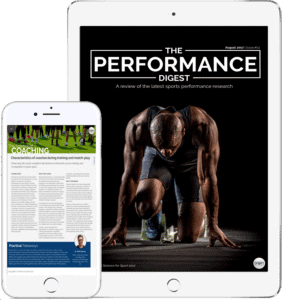 Aspects of an athlete’s lifestyle that may impact the validity of body composition, and how to standardise these factors to improve measurement accuracy. To conclude, there are a multitude of body composition assessment tools available to the practitioner, each with varying cost, accessibility and accuracy in each population. It is important to understand the benefits and limitations of each method, and how best to utilise each one in practice. Most assessment tools are useful in various settings, and accuracy can be improved with proper standardisation prior to testing. Sports Science entails many, many topics. 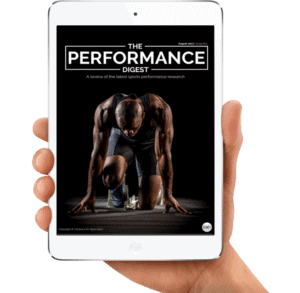 By choosing to simply read up on Body Composition Testing and ignore the sea of other crucial Sports Science topics, you run the risk of being detrimental to your athlete’s success and not realising your full potential. To make you an expert coach and make your life as easy as possible, we highly suggest you now check out this article on Hydration Testing. Franchini, C. J. Brito and G. G. Artioli, “Weight loss in combat sports: physiological, psychological and performance effect,” Journal of the International Society of Sports Nutrition, vol. 9, p. 52, 2012. https://jissn.biomedcentral.com/articles/10.1186/1550-2783-9-52. P. Clarys, A. D. Martin and D. T. Drinkwater, “Gross tissue masses in adult humans: data from 25 dissections,” Human Biology, vol. 56, pp. 459-473, 1984.